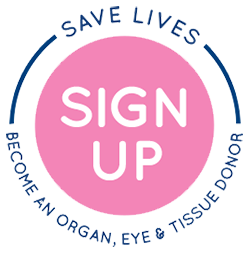 Sign up to be an organ, eye and tissue donor here! Anyone, regardless of age or medical history, can sign up on the Donate Life California Registry at the DMV (must be at least 13 years of age to sign up online.) Families of registered donors under the age of 18 must still consent to donation before it can be carried out. You can sign up by checking “YES!” at the DMV when applying for or renewing your driver license or ID. Anyone can become a potential organ donor regardless of age, ethnicity or medical history. All major religions support or permit organ, eye and tissue donation. Find out about your faith’s religious views on organ donation. More than one-third of all deceased donors are age 50 or older, and nearly 10% are age 65 or older. One person can save eight lives and enhance 75 others through organ, eye and tissue donation. Nearly 114,000 Americans are currently waiting for an organ transplant, nearly 22,000 live in California. An organ transplant is their only remaining medical option. Sadly, an average of 22 patients die every day while waiting, simply because the organ they needed was not donated in time. Approximately 98 organ transplants take place every day in the United States, that’s more than 36,000 people who begin new lives a year! More than 1 million tissue transplants are performed each year and the surgical need for tissue has been steadily rising. Corneal transplants, meanwhile, restore sight to 50,000 people each year. Learn more about organ and tissue donation at Donate Life California.